Figure 6.4. sFLCs in 142 patients presenting with dialysis-dependent, acute renal failure. Severe renal impairment changes the dynamics of FLC clearance. As GFR reduces, the clearance of FLCs decreases and becomes more dependent upon the reticulo-endothelial system, which shows no size preference and clears both κ and λ FLCs at the same rate. Therefore, as renal impairment increases, the serum half-life of κ FLCs approaches that of λ FLCs and their serum levels become more influenced by their underlying production rates. 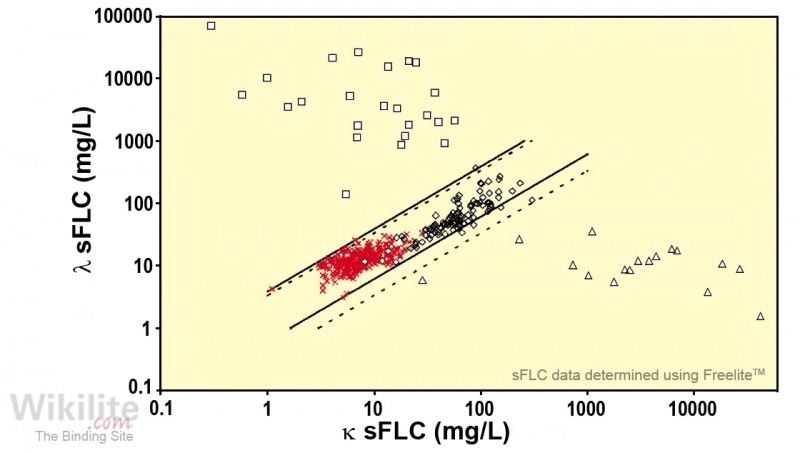 Consequently, the increase in the concentration of κ sFLCs is greater than λ sFLCs, and in a minority of patients the κ/λ ratio can increase above the normal reference interval in the absence of monoclonal gammopathy. This was demonstrated in a study using Freelite on serum samples from 688 patients with chronic kidney disease (CKD) and no evidence of monoclonal gammopathy . As both κ and λ sFLC concentrations increased in patients with deteriorating renal function, their relative amounts changed slightly (Figure 6.3A). As a consequence, with increasing CKD stage, the median sFLC ratios were found to increase progressively from 0.6 to 1.1, with a 100% range of 0.37 - 3.10 (Figure 6.3B). Therefore, a κ/λ sFLC reference interval of 0.37 - 3.10, termed the "renal reference interval", was proposed for patients with renal impairment . A similar trend was observed by Galvani et al. . The diagnostic accuracy of the Freelite renal reference interval was assessed in an unselected group of 142 patients who presented with dialysis-dependent acute kidney injury (AKI) of unknown cause . All 41 patients with MM had abnormal κ/λ sFLC ratios by both the published reference range and renal reference range (Figure 6.4). Receiver operating characteristic (ROC) analysis showed that application of the renal reference range for the ratio increased the specificity from 93% to 98% with no loss of sensitivity. The diagnostic utility of the κ/λ sFLC renal reference range was further demonstrated by Park et al. . A combination of sFLC analysis (using the renal reference interval) in combination with SPE, was the optimal screening algorithm for detecting MM in patients with renal impairment (Section 23.3.1, Table 23.4). Palladini et al. studied the performance of the renal reference interval in 982 newly diagnosed AL amyloidosis patients of whom 16% (160/982) had severe renal dysfunction (eGFR<30 mL/min/1.73m2). Use of the renal reference interval in patients with renal failure improved the overall diagnostic sensitivity from 70% to 74%. This was due to an increase in the diagnostic sensitivity in patients with λ clones, but a decrease in the performance in κ clones. The authors concluded that "patients with AL amyloidosis and severe renal failure whose κ/λ sFLC ratio is <0.37 likely harbour a λ clone". In conclusion, use of the Freelite renal reference interval in routine clinical practice may lead to increased diagnostic accuracy for the diagnosis of monoclonal gammopathy. For patients with CKD, a κ/λ sFLC ratio of 1.66 - 3.1 is likely to be caused by the change in FLC clearance and further investigation is only warranted if there is a significant clinical suspicion of monoclonal gammopathy.